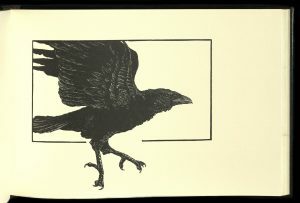 First published in 1845, Poe’s narrative poem The Raven tells of a talking raven’s mysterious visit to a distraught lover, mourning the loss of his love named Lenore, and traces the man’s slow descent into madness. Although the poem did not bring Poe much financial success, its publication made him widely popular in his lifetime. While critical opinion is divided as to the poem’s literary status, it remains one of the most famous poems ever written. 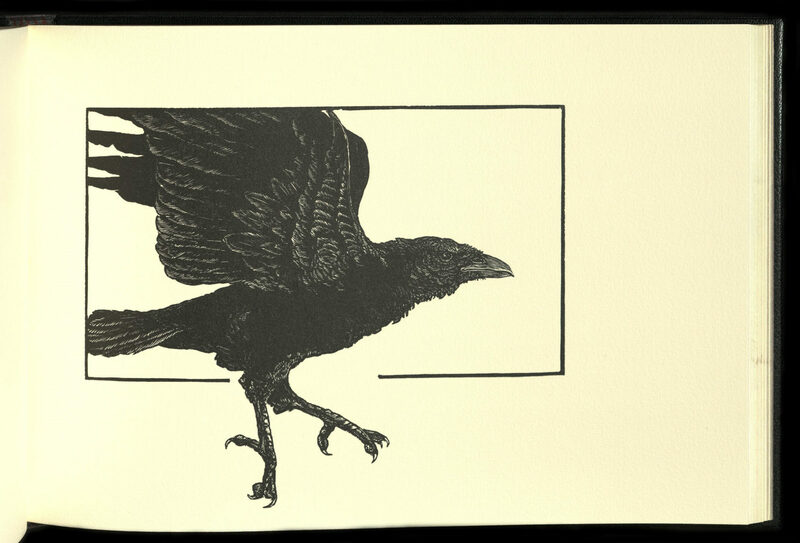 Fully redesigned by Alan James Robinson, this edition of The Raven was issued in a new edition of 225 copies by Chelondiidae Press. The text, printed by Daniel Keleher at Wild Carrot Letterpress, is the original Lorimer Graham version with the author’s corrections. Wood engravings and etchings are by Alan James Robinson and printed by Harold McGrath. The paper is Magnani mould made letterpress. Bound in full leather by Daniel E. Kelm and Sarah Pringle at the Wide Wake Garage. Signed by the artist. Rare Books copy is Artist Proof number VI.